Sometimes the food we buy is less about actual food and more about science. This "food" does tend to come in tubs, plastic packages, or bottles. Cool Whip, made by Kraft, is one of those wonder products that saves time. No whisk or blender needed - just a tub of this stuff and you are in ice cream sundae heaven. That convenience will cost you. At an average of 41 cents per ounce, you're buying mostly water and air for just over twice what it would cost to whip real cream yourself. Now, if that grosses you out - you have another option that seems a bit better - truwhip (photo above) is billed as "not your mother's whipped topping" and can be found here: truwhip store locator. They have dropped the high fructose corn syrup and a bunch of the other questionable ingredients. Water, organic tapioca syrup, expeller-pressed palm kernel oil, organic cane sugar, organic palm kernel oil, contains less than 2% of each of the following: organic soy protein concentrate, sodium caseinate (milk protein), organic tapioca starch, natural flavors, organic soy lecithin, xanthan gum, guar gum. contains milk and soy. Again, it is going to cost you at $3.69 per tub - but it tastes really delicious and is a great way to turn plain fruit into a dessert. Finally, there is homemade whipped cream - which is my preference when I have the time. The bonus is that you burn calories while making it! Homemade whipped cream has the same amount of calories as the two packaged toppings and it tastes amazing. Check out this clear and concise post on how to make your own whipped cream on Real Simple. What do you think of Cool Whip? I don't think I can ever buy or eat Cool whip again! What about people who are lactose intolerant? Most of them don't know about things like coconut whip cream. Most of them don't even know they can eat aged cheese! Think I will stick to cream and air! 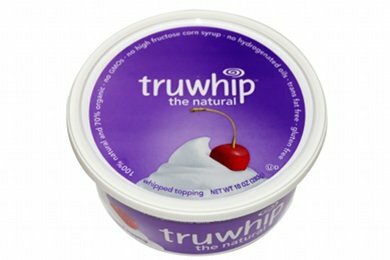 I have seen Truwhip at the health food stores, and it's really a shame they sell it there because people automatically assume it's all-natural healthy stuff. There are quite a few questionable ingredients in there - and that brings me to, there shouldn't even be "quite a few" ingredients in there, questionable or otherwise. It literally takes just a few seconds to whip up your own. I don't even consider pre-made a "timesaver." I definitely had NO idea it was this simple! Thank you so much for sharing! I stopped buying Cool Whip years ago because I read the ingredients. TruWhip doesn't sound any better. Nothing tastes better than homemade whipped cream. I stopped eating cool whip years ago similar to Head Ant...after I read the label. Snack girl what about the whipped cream in a can. Some of it is whipped topping but some is whipped cream. Wouldn't that be a good alternative to the whipping impaired such as myself? @disco dotty - whipped cream in a can is another good option - has added sugar - but I think it is no big deal. Isn't palm kernel oil really bad? I thought that was what the movie theatres had to stop putting on the popcorn they sold. I'd make mine from scratch as well and forgo the questionable ingredients in both. That video was horrifying! I don't like cool whip because I think it tastes bad, but now I have many more reasons not to eat it. Unrelated: I <3 Chris Hardwick. That video won't play because I'm in Canada! Off to you-tube to see if I can find another version... preparing myself to be horrified! @ Anna, the reason why palm oil/palm kernel oil is so bad it because in order to get it they are cutting down the rainforest at alarming rates and not replanting. If anyone can't view the video, there is a free podcast of it on iTunes! I like the taste of real whipping cream or even fat-free whipping cream whipped with air or in a propellant can like Redi-Whip better. i've never felt the need to buy an aluminum jar and tiny CO2 cartridge to do it at home, but I was thinking the other day if I did I could mix matcha powder in the cream and make "green tea flavored whipped cream" to go with a green tea frappuchino and strawberry mochi. Random. I know. Cannot stand Cool Whip or any of it's brothers, sisters, or cousins. After reading the list of ingredients about twenty years ago, I just started buying whipped cream all the time. My mother at one time started buying Dream Whip in the little packets. What's in that, Snack Girl??? the truwhip is still just oil & sugar, mostly JUNK. have whipped cream. the vegan craze seems silly to me. animals exist for consumption (in moderation). veganism seems negative to me. its mostly about what you CAN'T eat as apposed to eating.